It doesn’t take a calendar to know spring is here. Spring is surely in the air but it’s also in the trees; it’s clawing through the dirt; it’s singing from vernal pools, streams and lakes; it’s even in the heavens. Orion is chasing Taurus out of sight as we turn away from the bright stars of the winter nights. Ursa Major (big dipper) and Ursa Minor (little dipper) will become prominent features and can serve as pointers for finding the North Star, Polaris, plus a number of summer constellations. And while we are losing the bright stars of winter, two of summer’s warm lanterns are ascending. By mid-summer Vega, the North Star of eons ago, and Deneb, a bright giant thousands of light-years away in deep space, will take their place almost directly above us. And if you get out on a warm early spring evening (and there will be warm, early spring evenings) to wave goodbye to Orion and Taurus you are likely to hear the musical chirping of spring peepers and/or the long, loud trill of the American toad. A chorus of peepers and toads is reason enough to be out on a spring evening. The satin-white petals of bloodroot are beginning to push through the grey-brown winter leaf litter. Hepatica, violets, anemones and spring beauty are all showing their pretty heads. Trilliums and the cascading pallet of spring ephemerals will soon be beckoning. And don’t forget, the 2018 Spring Wildflower Pilgrimage in the Great Smoky Mountains National Park is just around the corner – April 24 – 28. We spent last weekend in Greensboro at the Tarheel States swim meet, where we were snowed on all evening Saturday. But on the ride home Sunday, it was 50 degrees and the roadsides were awash in the reds and oranges of maples, the deep pink of redbuds and the wispy white of serviceberry. Migration has picked up at Lake Junaluska. There was a recent sighting of a white-winged scoter, a rarity for the lake, plus common loon, blue-winged teal, red-breasted mergansers, Bonaparte’s gull and others. 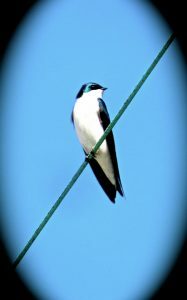 Swallows and purple martins are also, once again skimming the waters of the lake. I saw a post on Facebook from Brent Martin, owner, along with his wife Angela Faye, of Alarka Expeditions noting that the first blue-headed vireo of the season had been heard at Alarka. And I have been seeing photos from Black Bayou Lake National Wildlife Refuge in northeast Louisiana of black-and-white warbler, northern parula and prothonotary warbler. And birds aren’t all that are a flutter over spring. Journey North noted, on March 22, observers along the Gulf Coast of Texas were recording hundreds of arriving monarch butterflies. And, closer to home, there have been reports of West Virginia whites, mourning cloaks, falcate orangetips and eastern-tailed blues around the region. Spring is here, believe it or not. I know, I know, we’ve still got dogwood winter and blackberry winter and “it’s too cold to go for a walk around the lake” winter etc. etc. But these harbingers don’t lie – it’s spring and don’t blink or you’ll miss it.